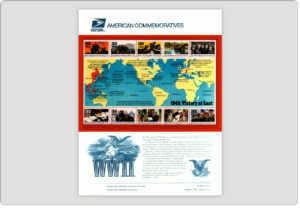 USPS Commemorative Panels have been issued for every US commemorative stamp by the Postal Service – since the Wildlife issue of 1972 8c block of four. Each 8-1/2 x 11-1/4 inch Panel is printed on card stock with engraved vignettes on issues prior to 2002, or with photo-engravings and artwork on issues starting with 2002. Each Panel also includes subject-related text and a mint block of four stamps affixed to the Panel in a mylar mount. Some strips of stamps, larger blocks, and even full sheets have been provided for certain issues, in some cases even requiring two panels. 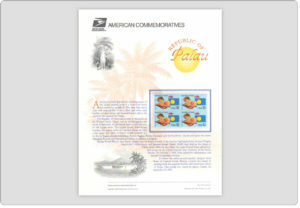 Some USPS Commemorative Stamp Panels are easier to acquire than others due to supply and demand. Different quantities of panels have been produced at certain times, even though the quantities sold to subscribers were always equal. There are also cases where two panels issued in nearly identical quantities might vary in price by a factor of 10 or more, and this relates to some panels being more in demand than others due to popularity. Questions? If you have questions about any of our Commemorative Panels, please ask on our Contact Page. 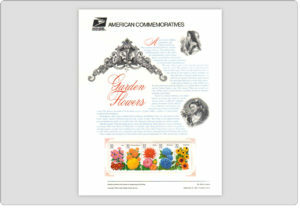 469 32c Garden Flowers Commemorative Stamps Panel. 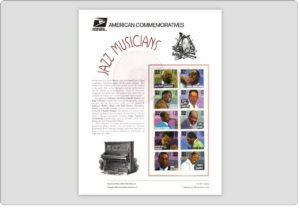 #465 32c Jazz Musicians Commemorative Stamp Panel. #470 32c Republic of Palau USPS Commemorative Stamp Panel. 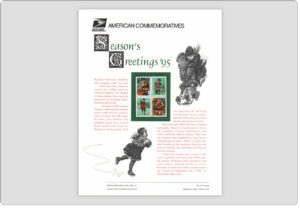 #471 32c Christmas 1995 USPS Commemorative Stamp Panel. #468 32c 1945 World War II Commemorative Stamps Panel.